We were going to travel to our old house this weekend to continue readying it to sell and maybe meet with realtors, but we didn’t. We had reasons. Like EJ originally thought he’d have to work this Friday. By the time I understood that he had it off, it was mid-day on Friday and I was no longer mentally prepared for a long trip south. Also, EJ had told me he was really exhausted. Our weariness has been long in the making and goes deep. So I had thought, “Hey, we don’t really have to go down this weekend.” It’s just as well that we didn’t because southern Michigan had terrible storms and severe heat. It would have been miserable trying to work under such conditions. Mostly, though, we are having trouble leaving our new house. We really love it up here. But, we tell ourselves, next weekend we have to go to the old house. Saturday we rested. We even took naps. Later I started to go outside and saw a black cat in the yard. We haven’t seen any other pets in our yard except our own since we moved here so I was sure it was Little Bear. I yelled frantically, “EJ! Little Bear escaped!” and walked toward the cat, but it ran off into the forest. I looked at the doors and windows to make sure they were all shut, and they were, so EJ and I did a head count. We found all the cats except Little Bear–but then I saw him on the window ledge in the entrance hallway. Whew! In the wee hours the night before, Timmy jumped off the headboard of our bed and jumped on my stomach. Ooomphf! The cats are silly. 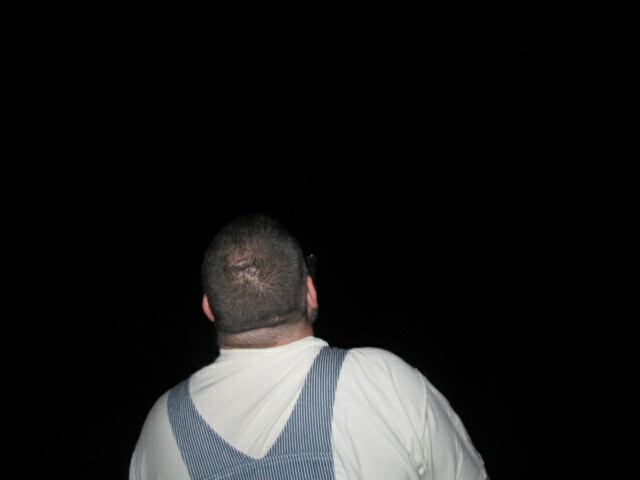 EJ looking up at the stars. My camera is not good enough to capture the stars. Saturday evening, not long before JJ returned home from work, I walked outside and stood on our small deck. It was so beautiful and quiet outside that I called EJ to join me. We sat outside as the sky got darker and dark and darker. The Forest is a bit spooky at night because it’s so very, very black. The sky looked much like this. 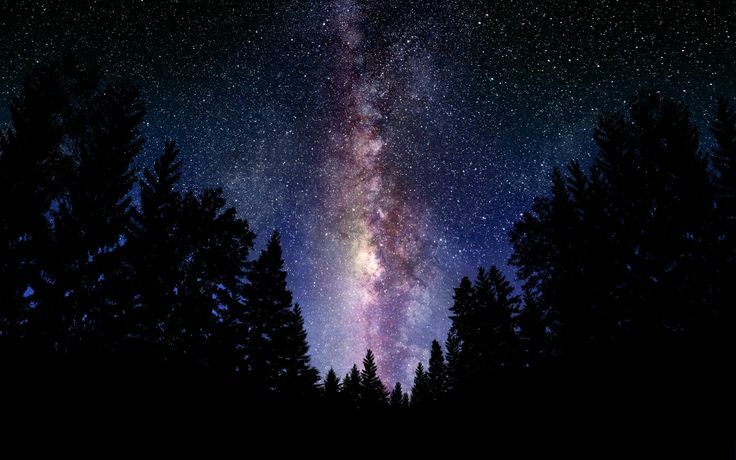 As the night darkened, the stars began appearing. First a few, and then more, and then the sky was filled with stars. We turned off all the lights inside and outside the house and gazed upward in awe. With us being on a hill, it feels as if we are tilted and that if the earth shrugged even a bit, we’d fall into the sea of stars. JJ’s Tablet showing me the names of the celestrial objects in the sky. We got out our binoculars to look at the stars, and then EJ brought out the telescope, but he couldn’t find all the pieces, which apparently were separated in the move to the new house. I’m sure they are around here somewhere. 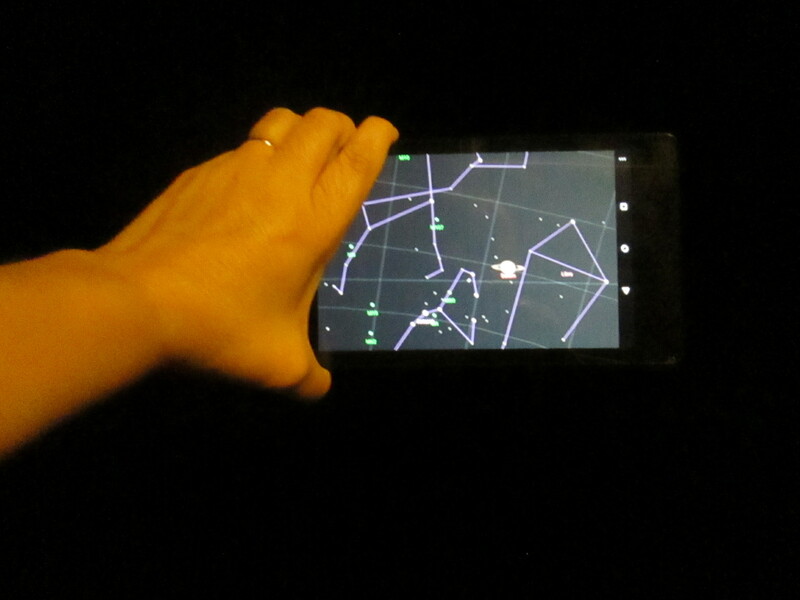 Since we aren’t expert astronomers or anything, JJ let me borrow his Tablet, which has a really cool astronomy app on it. When I pointed the Tablet in any direction, it showed me the names of the planets, stars, and constellations that I was aiming at. I was totally excited when I saw a meteorite streak across the sky. It was so big and bright that it had a tail. We saw several meteorites after that as well as many satellites. It was awesome. EJ and I were reluctant to end our Enchanted evening and didn’t come inside until 2 a.m. Morning came very early, beginning with JJ complaining of no hot water to shower in. It was simple for EJ to relight the pilot light on the water heater, which had gone out, but JJ had only a lukewarm shower before work. EJ and I were both really tired today, but our evening was worth it. Despite my exhaustion, I was quite productive today. I washed all the dirty clothes, hung them on the clothesline, took them down, folded them, and put them away. I made a yummy meal of chicken breasts and potato salad, and EJ helped me pull our bed away from the wall so I could paint behind it. Now, finally, the master bedroom is completely painted. I just have to paint the master bathroom and the kitchen and then the painting will be all done. Ugh. I hate hot, humid, and mosquitoes. I’m really glad we stayed up here too! But one of these days we’ve really got to get back down there…. Sounds like a wonderful time to sit and watch the stars. Here in Northern South Dakota, we also have great views of the stars. It was something we missed when we lived in Jamestown, ND. For some reason, I think being beside to large reservoirs, the stars are not as visible there. Hope you are up to the trip this week. Selling your other house will be a great relief in the long run.